Courtesy photo by Ralph Dieter Eagle Scout Michael Chen with his parents, Laura and Jack. A ceremony of recognition for an Eagle Scout was held June 18 at Bedford Presbyterian Church. 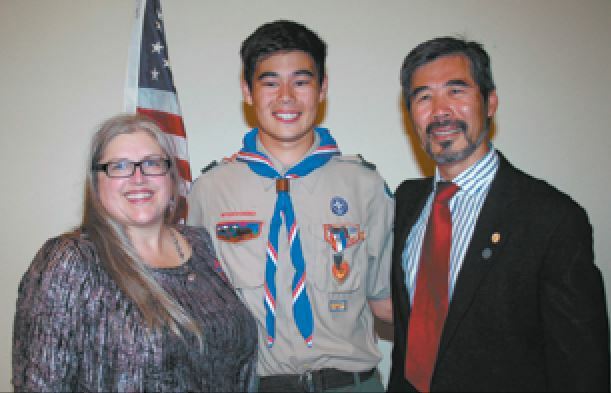 About 60 people gathered to recognize the presentation of Eagle Scout to Michael Chen. The Ceremony of Lights and the Eagle Scout Pledge was administered by Scoutmaster Ron Carvalho. The Charge to the Eagle Scout was given by Committee Member Stephen Carter. Presentations were made by representatives of the Marine Corps League, VFW Post 8401, and the Grand Lodge of Masons. Many friends came forward with stories about Michael, some funny and some serious, all pointing out that Michael is special. A reception was held in Fellowship Hall, it was obvious that there were many high school friends in attendance. My Eagle Scout service project involved the replacement of several deteriorated bog bridges in the Van Loan Preserve in Bedford, NH. A scout mom, Mrs. Beck, mentioned that she had been out for a run through the preserve and that many of the bridges were hazards due to wear and tear and weather damage. About a week later, another adult leader sent a note to Life Scouts that Mr. Tolf from the Bedford Land Trust was looking for an Eagle candidate to repair those same bridges in the preserve. He had obtained a grant from the Bedford Conservation Commission and needed someone to take the next step on the project. I met with Mr. Tolf and got more details on the project. I had always expected I would get to have my own Eagle project bake sale fundraiser but I didn’t need to thanks to the grant. I was about to get started on my project when I suffered a knee injury and had surgery. Then I had to wait for the snow to melt and for my swim season to finish so I would have time to devote to the project. Since the bridges involved hauling heavy pieces of lumber, I enlisted high school age friends and scouts to help me. We did some prep work in my garage and hauled materials to the trailhead area with a trailer. Then we had to transport the bridge parts into the preserve where we removed the old bridges and replaced them with new ones. Sometimes we were able to use a wheelbarrow and other times we burned a lot of calories. The project took over 150 hours to complete, including making presentations before the Bedford Conservation Commission, acquiring materials, doing the labor, and then documenting the work in the service project workbook. I’m glad to know that people can more safely walk the trails at the Van Loan Preserve thanks to this project. I would like to thank Lowe’s for giving a nice discount on the materials, to Mr. Tolf, Mr. Fortin, Mr. Biedrzycki, Mr. Dieter, Mr. Romano, Mr. Carvalho, and my parents for their support, and to my friends Danny, Rohit, Jonathan, and Kai for all their hard labor on my project. I couldn’t have done this without you. I was born in Manchester, NH, in 2000 after my parents moved to Bedford in 1999. While I have two older sisters, Mandy and Elisa, I always wanted a brother but my mom said she was all done. Instead, I found brothers in Scouts and sports. I joined Cub Scouts midway through 3rd grade and discovered quickly that Cub Scouts meant frequent contact with friends. Plus, being in Cub Scouts meant I was allowed to build fires, go hiking, kayaking, and camping. After earning my Arrow of Light in 2011, I crossed over from Pack 5 with my friends, Nicholas, Thomas, Karl, Matt, Ryan, and Bryce, to Troop 414. I loved having these friends in the troop with me and I formed friendships with the older scouts, too. The older scouts taught me the skills I needed to advance through the ranks and to have a lot of fun at summer camp at Hidden Valley and Wah-Tut-Ca. My favorite memories are of cheering on and participating in Iron Man races and going out at night to capture troop flags. During the rest of the year, I spent a lot of time preparing for and hanging out at campfires, and helping with Eagle Scout projects and fundraisers. I faced challenges with balancing leadership roles as patrol leader, historian, and troop guide with my other extracurricular activities. During my trail to Eagle, I continued to be active in swimming, soccer, student council, ultimate disc, and work repairing phones at NH iPhone Repair. 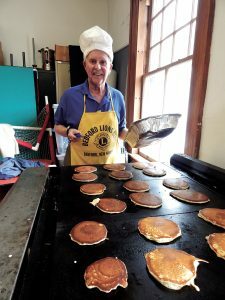 Still, I managed to complete several 10-mile hikes and a 20-mile hike in one summer and used what I learned from the sailing merit badge by sailing on Dublin Lake, Pawtuckaway Lake, and Umbagog Lake. In 2014, I earned a special award, the Certificate of Merit, for putting out a fire that had started in the basement of my house and getting my family to safety. My thanks go to the adult leaders, from den leaders and scoutmasters to merit badge counselors, that I worked with in Pack 5 and Troop 414. These leaders each played a significant part in the formation of the young man I have become.